Subscribe to our mail list to receive information on class dates. We will email you when classes or come and try days are available for purchase. Fairfield Canoe Club has a strong tradition in teaching people to paddle and runs a variety of courses throughout the year - although we slow down a bit during winter. All courses are run at the clubhouse in Fairfield on the Yarra River and are usually held on a Saturday or Sunday morning. All participants must confirm that they are able to swim 50 metres which is our minimum safety standard. These public courses are open to males and females over the age of 10 years old. Each course is limited to 6 participants per coach for safety and coach-student ratio. Courses can be booked and paid for on-line through the club website. All class dates are shown in the right column of this page (when available). You can book and pay for your course (using try booking) The course booking options are shown at the bottom of this page. If classes are full, and you wish to be kept informed about class dates, Subscribe to our class update email. This page lists our club coaches, many of whom are also available for private lessons. After the success of our initial Come and Try days we are pleased to continue this course at Fairfield, aimed at giving participants a brief sample of both canoeing and kayaking. You will spend most of the time on the water getting to feel what it is like in both canoes and kayaks. It is a great way to try the activity if you are not quite sure whether the sport is for you. The come and try session is a great stepping stone to the other FCC courses. The cost of this one-off session is $30. Read about the first Come and try canoeing and kayaking day. This is a two session course aimed specifically for people new to paddling who want to learn the basics. 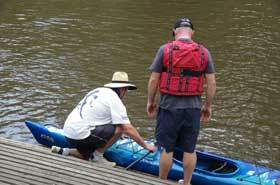 We use very stable kayaks and aim to get participants comfortable with safety and boat control. The first session begins with a clubhouse presentation on safety, paddling technique and equipment essentials. The last half of the session is spent learning to get in and out of a kayak and introduces basic paddling on the river. All of the second session is spent on the river developing good boat control and paddling technique. The cost of this two week course is $70 (2 x 2 hour sessions). This is a four session course aimed at developing paddler's skills beyond the basics. The first one or two sessions are similar to the Introduction to Kayaking course, starting with safety and then using very stable craft to learn good boat control and paddling basics. Depending on the skill and enthusiasm of participants, sessions 2, 3 and 4 aim to give paddlers confidence in different types of kayaks including less stable TK1s and TK2s. 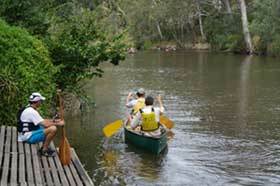 In session 4 a brief tour on the Yarra away from the clubhouse is usually scheduled. Course 3 - Junior Flatwater Paddling. We run junior paddling groups (8-16 years old) for paddlers who have done little or no kayaking or canoeing before, to take them to the point of safe and controlled paddling, ready to join club training paddles, social paddles or races. It begins with the "PaddlePower Introduction" sessions and moves into our ongoing junior program, which runs all year during school terms as well as occasional camps during term breaks. Initial focus will be on safety, basic technique and boat setup, bracing to preventing capsize, recovery. Moving on from there the course will build the young person’s self reliance, skill levels and start competitive paddling techniques. From 2018 we are running at least two groups: a younger/ less experienced group for 8-12 year olds and an older/ more experienced group for 12-16 year olds. We are also running a junior canoe polo group. The cost of these sessions is $15/session (reducing to $7.50/session for juniors who have joined the club). 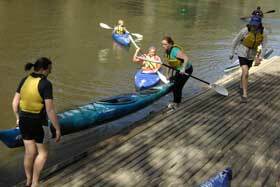 This is a four or six session course aimed at developing canoeing skills. It is suitable both for beginners to paddling, and for kayak paddlers wishing to "step out" into single bladed paddling. The first two sessions are similar to the "beginners and beyond" kayaking sessions, except in canoes, using stable TC1s and TC2s. We then work on technique for boat control which is useful in racing - both marathon and sprint, and in white water and flat water touring. In the final sessions, longer paddles will be arranged taking participants up or downstream of Fairfield. The cost of this course is $100 (if 4 sessions) and $120 (if 6 sessions). Extra classes may be available after you have completed one of the above courses: your coach will let you know. See below for details and booking. Please wear comfortable clothes that you don't mind getting wet - shorts, leggings, tracksuit, no jeans. Hat, sunscreen and sunglasses for a sunny day. Please bring a towel and change of clothes, there are showers at the club. Please note we are NOT at the Fairfield Boathouse. These courses give paddlers a taste of what is involved in paddling and in the past many participants have decided to join the club to further their paddling skills. Some go on to racing, others touring but invariably they all enjoy the fabulous paddling facilities available. We recommend that all prospective members undertake one of the courses available prior to applying for membership so that they can sample the activity before committing to membership. Having joined the club there are a number of coaches that provide private lessons and the club organises other regular activities. For more information on memberships, refer to the Join FCC page. I have paid online, what happens next? Once you have paid (using Try booking) you will receive an Invoice. Occasionally river conditions make paddling on the Yarra unsafe. The club will contact you if the course is to be rescheduled. The Additional or extension class can only be purchased if you have previously completed a FCC canoe or kayak class and your course coach has let you know that addtional classes are available. Purchase an extra class now. 3/ The date of the extra class ie the extra class that you are paying for. Nb: you can only purchase the 'Extra class' if you been advised by your coach that an 'Extra class' is available. "Tony was a fantastic teacher - he was warm, funny, and knowledgable. I felt very confident under his instruction. I can be a nervous learner but didn't feel this at all in this class. It was very casual and friendly. The price was a really attractive part of doing this course as it gave me the chance to try it out without a huge financial commitment." "I found the course had everything that I as a beginner needed, support, encouragement whilst not being too long so as not to create exhaustion. Its hard to know when to stop when your having a good time and yet still be able to move the next day!" "Julie was very welcoming, accommodating, reassuring, patient, positive and encouraging, as were the other members who happened to be in the boathouse on Sunday morning. It was nice to walk in and be spoken to in such a friendly manner." Alex James at the club landing. Canoes heading upstream on the Yarra. Club coach Tony Payne at the landing, getting into a kayak.